I was talking to my Oklahoma friend today and was told that their entire family had somehow contracted a case of head lice. It seems to be going around their school and their sixth grade daughter brought it home for the family. 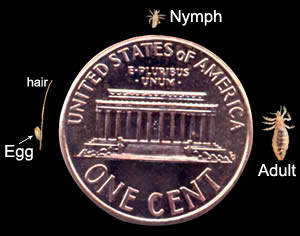 Head lice can be found on the human scalp: on the head, eyebrows, and eyelashes. They feed on human blood several times a day. Head lice move my crawling. They don’t hop or fly. They are often spread by contacting someone’s hat, coat, comb, brush, or towel that is used by someone affected by the insect. 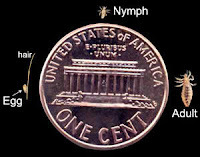 Head lice have three forms: the egg (or nit), the nymph, and the adult. The CDC website has a good photo of the actual size of these three forms. The egg is laid on the hair shaft near the scalp. The nits hatch in about 8 days. It takes about a week and a half for the nymph to reach maturity. They can do so only on a diet of human blood. The adult must also feed on blood. They only live about a month as adults but lay about six eggs each day. If the lice falls off the persons head (or is on a brush, pillow, etc.) it will only live for about two days unless there is another head that it comes in contact with. Imagine you just went to the doctor’s office, or the bank, or a restaurant. You sit down on their nice comfortable chair and sink yourself in. Your head rests against the nice cushioned chair. Finally you get to relax a bit while you wait. But what if the person before you had head lice? Or a person from the prior day? What if the kids at school hang their coats up on hooks and they all get piled on top of each other? It’s no big deal. Perhaps it will be just one little louse. But what if that one was a female, just reaching adulthood? She could lay six eggs a day for a month. They won’t even start hatching and you’d have no idea you were infected with them until you had 75 or 80 on you. Even then, you may itch for a second or two but you’ll just sluff it off. In her month long life of laying eggs she will lay around 180 eggs. If all 180 hatch and half are female, then in a couple of weeks 90 more lice will start laying eggs. In one month, and before you really realize what’s happening you can have over 16,000 lice sucking the blood from your scalp! If you don’t get them taken care of in another month you will have almost three million disgusting creatures on you. Now, I’ve never heard of anyone having three million lice. You’d probably die of anemia by then! How do you make sure you get rid of them in your house? You don’t need to fumigate the house. The lice aren’t going to live more than a couple days without sucking blood so if you just stay off the fabric sofa and chair, change and wash the sheets on your bed each day for a few days, wash all clothes that you’ve been wearing for the last couple days and vacuum your house you should be good. Have the wash water greater than 130 degrees. The lice don’t just walk around, they usually cling to hair that fell off your head and they just had the misfortune to be clinging to that particular piece. Although lice and nits don’t like cold temperatures, you’d have to have something in the freezer for a couple of days for it to kill them. Pyrethrins. (Rid) These use the pyrethroid extract from chrysanthemum flowers. Pyrethrins are safe and effective when used as directed but only kill the live lice. You have to do a second treatment to kill newly hatched eggs. If you are allergic to chrysanthemum or ragweed this is not the remedy for you. Permethrin. (Nix) This is a synthetic pyrethroid. This too doesn’t kill the eggs so a second treatment is necessary. This one is not approved for kids under two. Malathion lotion. (Ovide) Same malathion used to kill mosquitos and bugs in the yard. You need a doctor’s prescription for this one. It kills the live lice and some eggs so a second treatment will probably be necessary. Benzyl alcohol lotion. (Ulesfia) It only kills live lice so a second treatment is necessary. It’s approved for children over six months. This needs a prescription. Lindane shampoo. This needs a prescription but it’s not recommended since it can be toxic to the brain and other parts of the nervous system. Lice Shield Shampoo and Leave In Spray. Lice Shield is formulated with a blend of citronella, eucalyptus and rosemary essential oils. Found at Walmart, Walgreens, etc. Listerine. Soak your hair in Listerine. Put on a plastic shower cap. Wear this overnight. Vinegar. Wash your hair in vinegar. Oil or Mayonnaise. Rub this into your hair. After it’s been on your hair for two hours wash it out. Iron. Use a flat iron daily. Spend hours combing the nits out of each strand of hair. Use little metal lice combs. Get several! Figure out how you are going to control this creature and prepare. My friend had to drive 45 miles from home to find a store that carried Rid or Nix because of the local outbreak. Up until recently, most of my food storage has been of the “pantry” storage type. Meaning, most of the foods that we eat on a regular basis bought from the grocery store. We have some long term storage foods in our storage plan, but recently, and for obvious reasons, I’ve started to increase these. I had some specific ideas on how I wanted to repack some of this food, but it didn’t go the way I had hoped. Up to now, all of the long term food items that I had were packed in cans, most of them factory sealed. This time, I’ve decided to buy bulk food and repackage it myself in order to take advantage of lower costs and stretch my food budget. While I started my plan of increasing what I had, the first step was really to take an inventory of what I had. During this inventory, I opened a couple of cans and was surprised on what I found. Let’s just say that you should plan on storing more than you think you need. Anyway, this is part one of the three part series on Repacking for Food Storage. Survival conditions often require safe, effective, inexpensive, easy to use and non-toxic methods for the treatment of wounds and injuries that may become infected. A lack of resources or services to properly treat simple medical conditions could become a life-threatening situation to your survival. Quite often simple resources are overlooked when seeking a solution to problems that can affect your survival. One of the simplest solutions to this problem is sugar. Sugar has been used to treat wounds for thousands of years by many different cultures. Sugar was used widely by early Egyptians to treat wounds and the infections that often occurred as a result. Sugar can be used to kill bacteria and germs in open and infected wounds almost as effectively as the best antibiotics available today. Sugar will also help speed up the healing process of the damaged skin tissue and reduce any inflammation that may be present. This is in addition to its antimicrobial action which kills bacteria and germs. This is accomplished by the osmosis and capillary action of the sugar granules. Powdered forms of sugar will be somewhat less effective and will require more frequent treatment and changes of bandages to achieve similar results. Simply clean the wound area thoroughly and sprinkle sugar over the cut or scrape until it is completely covered. This can be aided by using a cream (such as petroleum jelly) around the outside perimeter of the wound to keep the sugar granules in place. Then cover the wound with a clean bandage. Use gloves if possible or thoroughly clean your hands to keep conditions as sterile as possible when treating the cut, scrape or wound. Most injuries will require the wound to be cleaned, re-treated with sugar granules and a clean bandage applied every 4 to 6 hours to obtain the maximum healing benefits. Make sure the wound is covered completely and evenly with sugar granules and covered with a clean, fresh dressing each time. Caution: Sugar should never be applied to openly bleeding wounds as it may actually increase the blood flow and further complicate your condition. Sugar can be used to sweeten your tea or coffee but it can also help you as a first aid treatment for infections in a survival situation. Disclaimer: This information is provided for informative purposes only and should not be considered medical advice of any kind. Always seek qualified professional medical help when needed. Assuming that you have your water supply squared away, it is now time to think about food. Again, the absolute minimum recommended by authorities is three days worth of food, but given what we’ve seen in Japan, where it has taken ten days or more to reach some communities, my personal recommendation is to have at least three weeks of food and water on hand. If you can store more than that, then by all means do so. There are as many schools of thought about what you should set aside as there are types of food. One option beloved by the camo crowd is the military field ration. Known as MREs in the US and IMPs in Canada, these are pre-packed rations intended for troops in the field. They tend to be somewhat bulky until field stripped, may not be considered tasty by all, and their storage life can be considerably compromised by high temperatures. The advantage is that they may be eaten cold or hot (some come with a chemical heater) and each ration is about 1200 calories, with a complete set of breakfast, lunch and dinner giving you roughly 3600 calories. They are pretty much nutritionally complete for the short term, although they can be deficient in some elements (Canadian IMPs do not have enough folic acid or calcium to meet requirements long term, for example). Another option is commercial freeze dried hiking/camping food. These usually come in packages of two or four portions, and generally require significant amounts of water to make them palatable. Add to the fact that in my opinion that they are fairly bulky versus the calories they contain, plus their high cost per serving, they would not be my preferred option. In their favor is a long shelf life, and that they are widely available everywhere from camping supply stores to Walmart. If you decide on a commercial product as part of your storage, consider something like Datrex emergency rations . They are small in size, high in calories, and reasonable in storage life (5 year). Remember that you are always trying to get the most calories for the smallest size (and price). You will need to do some research to see what is most appropriate for your situation. Then there is the bucket brigade, those storing buckets of wheat or beans and other things in food grade buckets, complete with oxygen absorbers , mylar bags and/or CO2 filling. While this option can be cost effective (bulk buying) and great for long term storage (25 years is claimed for wheat stored properly), the sheer weight and bulk of these buckets may make it a difficult option for the apartment prepper with limited storage. An easy way to start storing for emergencies is to store what you eat now. It’s easy enough to buy three instead of two cans of tomato sauce or an extra package of noodles the next time you go shopping, and if you stick with a weekly buying program you will build up an impressive amount of food very quickly. The downside of this is that you’ll need to create a rotation system to ensure older stock gets used and replaced, but this is relatively easy to do. I believe that if you are trying to get some serious food in reserve as an apartment occupant, your initial focus should be on the conditions in your living space. If you are in an apartment that swelters in the summer, you will not want to store foods that have their storage life adversely affected. The second thing to look at is your storage space. It might be damp, prone to insects or rodents (I’m thinking storage lockers here), or have other conditions that must be reckoned with. All of this should help you decide on what type of food you store, whether IMPs or cans of tuna, and what you store it in. Don’t be discouraged if your space is limited as there are likely spaces you haven’t thought of using, For example, simple things like plastic containers that slide under your bed will allow you to store an impressive amount of food and not compromise your living space. Dual purpose wherever you can. A blanket chest holding a single layer of cans of tuna under your spare bedding is now a blanket chest plus! Storing food is only one aspect of preparing to sit it out in your apartment. If you have good sunlight exposure, there is no reason not to be growing herbs by your windows. If you have a balcony, you are better off than you imagine. Using square foot gardening techniques (look it up) and containers, you can raise an impressive amount of food for the space available to you. I have seen one arrangement that used a bleacher like structure of containers that maximized both sun exposure and storage. Remember that in certain situations, a balcony full of tomato plants might make you attractive to others, so caution must be exercised. Again, getting access to the roof of your apartment is a must. While caution must be used in loading the roof with the weight of containers, soil, and plants, there is likely a lot of unused space getting a lot of sunshine up there. You might even be able to get access now, and get practiced at container gardening. Other usable room might be available if there are abandoned apartments in the building. This might give you additional balconies to use, or you might even have your own greenhouse of sorts if there is enough light and warmth. The grounds around your apartment building bear looking at as well. There may be space where a garden plot might be dug. Gardening may be difficult if the area is not protected from animal or human poachers. Still, it is worth looking at if you are going to be in your apartment through the growing season. If so, you need to be prepared preserve your harvest. There is little point to going through all the trouble if what you grew rots before you can eat it. Remember that canning/preserving, like gardening, are skills you need to learn now, before they are absolutely critical. Another thing to check on is the possibility of there being edible landscaping on the building grounds or on local streets. In my on neighbourhood, there are Nanking cherries, crabapples, and lingon-berries on public property within a block of me. Others may also be seeking the same supply, so cooperation might be necessary if there are a number of you trying to harvest the same resource. A better strategy might be to go after wild edibles. Depending on where you live, there will be a variety of ‘weeds’ that are edible and contribute necessary nutrients to the diet. There are things like purslane with its high iron content, or the Vitamin C content of wild rosehips, as well as things like burdock and cattails that can supply some starch to the diet. Proper identification is the key to safe consumption, as nearly seventy-five percent of all plants are toxic to humans to some extent and even some edibles (like acorns) need processing for safe eating. Again, it is a skill you need to acquire now, not after your judgment is clouded by hunger. Finally, consider doing some guerilla gardening right now. This can take a variety of forms. One is to garden a little plot in an out of the way spot. It might be the space between two buildings, a vacant lot or similar spot but it will allow you to practice technique as well as seeing where you can garden undisturbed. This should be at some remove from your apartment to avoid leading folk right to your home. Another is by planting certain crops in out of the way areas. The plants are then ignored and left to fend for them selves. My favorite for this is Jerusalem artichoke, a very hardy plant that will self propagate and has an edible root that stores very well. I’ve also done this with different varieties of squash, but with less success. The final method is to try to spread wild edibles. My choice for this is burdock, which I’ve managed to establish in several ‘secret’ locations by harvesting seed and planting it. It might not be five acres and self-sufficiency, but I believe you can bug in to your apartment without sentencing yourself to death by starvation. It takes work, forethought and lots of practice, but you can develop a storage and gardening program that will boost your survivability. We are currently house sitting for the next few weeks, firmly ensconced in upper middle class suburbia land. Each morning I take a three mile walk around the neighborhood and there are a few things that bother me here, safety wise. I noticed that the same half dozen home owners open their garage doors in the early morning and leave them open all day. I don't see the occupants outside so I assume they are in their house. I hope they at least keep the door from the garage to the house locked but still, leaving a garage full of possessions open to the public, even in what is considered a very safe neighborhood, is asking for trouble. What's to stop someone from stealing the stuff in the garage or worse, going into the garage, closing the garage door, using the tools hanging on the wall in the garage to break into the house and robbing the place or worse? There are quite a few walkers and runners enjoying the safe, nearly car-free streets of the neighborhood. Unfortunately many are wearing their iPods and wouldn't hear a truck if it was bearing down on them. 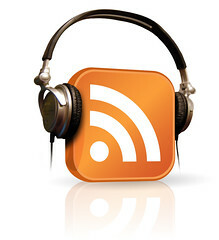 In the gym I like listening to my iPod when I work out, however outside, it is very important to be able to hear what is going on around you for your safety. It appears that this neighborhood is keeping more than a dozen service industries in business. Throughout the day you will see vehicles for yard guys, pool guys, housekeepers, bug guys, nannys, home maintenance/repair folks, etc. coming and going. With all of these people, it is hard to tell who belongs here and who doesn't and it would be quite easy for someone to put on a uniform of some sort and "blend in" for nefarious purposes. On a few occasions I have seen individual children walking by themselves and waiting by themselves at bus stops. It appears that most children are driven to school but I have some concern about kids waiting by themselves in the early morning, even though it is a safe neighborhood. Nearly every home has a home security system in place. I have no idea if they are used or not but I find many people with these systems who live in what are considered safe neighborhoods become lax at using them. It appears that many people who live here work in the city. With 9 to 5 jobs and long commute times, it is quite predictable, should someone want to plan a burglary, to note when people leave and when they come home, and plan accordingly. Being predictably unpredictable is a good thing. Some homes appear to be a beacon to thieves and others who could do the homeowners harm. There is a Mercedes in the driveway instead of kept in the garage. Window shades are often left open after dark so a potential burglar can easily look in and practically make a shopping list (56" big screen. Check. Two Apple MacBooks on the dining room table, Check.). Recycling left on the curb each week can provide more than enough information about the homeowners (one family appears to eat take out pizza daily, another has a box from a new Apple computer in the recycle bin). I'm a big fan of keeping things--from my possessions to my habits--private. Even though there are sidewalks, big beautiful homes, and friendly neighbors, there are always hazards that can threaten your safety if not your piece of mind. Loose dogs, cars backing up and not seeing you, new teenage drivers who think the quiet, straight roads would make a perfect place to practice for their future NASCAR careers, tots who get away from their harried parent/nanny and wander into the road, etc. In other words, even though you aren't on alert like you would be in the city, there are still many things you need to be aware of. Then there are the hidden safety risks such as teens at home when parents are working all day or gone for the weekend (drugs and teen pregnancy are well documented problems in the inner city but can be just as likely to happen in the suburbs) and houses left empty due to the recent spate of foreclosures (like many areas, this neighborhood has a handful of houses that now sit empty and unattended). Complacency may be the biggest threat to people's safety in this area. When an area is considered "safe", people automatically let their guard down which, maybe 90% of the time, isn't be a problem. It is the other 10% of the time, when the statistical aberration occurs, that something bad happens and people make the evening news saying something like "I never thought something like that would happen here." No matter where you live, it is important to take safety precautions seriously, even if you live in a "good" part of town. diner. They spoke broken English, and had bad attitudes. Dora had left the diner at midnight, when the diner closed. bugging out!". That tripped a memory. Bugging out. Dora went back to the diner, and unlocked the front door. read them aloud to the other servers, "Oh this is great"
sleep during the day" and "This guy is a real Rambo"
having the last laugh, tonight. and everything else Chris had said. Dora wasn't the only person having a hard time adjusting. down after a day or two. Chris and Gomer, in a while. The phones had been dead. package, it crinkled and wrinkled. Felt flimsy and junky. took her, and she slept the night. foil blanket, and stretched in the afternoon breeze. presented her with "Just a basic BOB" last Christmas. The big problem would be the inverted sleep schedule. daylight, she poked at the ashes of her house. the farm gates. Chris was right behind, in the Blazer. Gomer was zoned out, brain sucked into the video game. But, that meant more walk. Dora walked about half an hour. in, as she was out of sight. Julie from Food Storage Made Easy is here today to share her food storage space. space upstairs I use for day to day cooking. area, because it's just against a wall in my basement. In my "dream"
storage room downstairs I try to keep like foods together on shelves. and all sorts of other logical (to me) groupings. baking, so this way I'm ready to go right away. 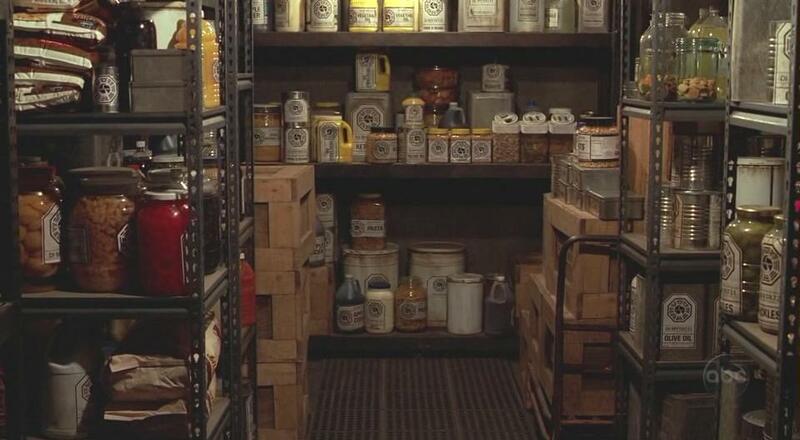 basement would just collect dust. or muffins and all that kind of stuff with whole grains a lot easier. I also use my legumes a lot more in soups and chili's. go grocery shopping I DON'T immediately put the food in the basement. I put it on the stairs DOWN to the basement and deal with it later. Thanks Julie! What an inspiration. With sacrifice and hard work, you can have a great food storage just like hers. 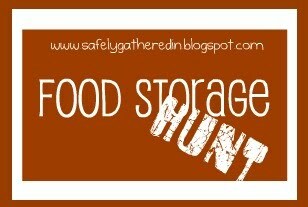 Be sure to check out Food Storage Made Easy for more great tips and ideas.